If you are in the market for an online broker, this Scottrade review will save you a lot of time and money. I’m going to spotlight the good, the bad and the ugly when it comes to this company. Over the last 28 years, I’ve learned what’s important about brokerage firms and my findings will probably surprise you. While often overlooked, your choice of brokerage firm is a critical success factor when it comes to investing. If you choose the wrong firm it will end up costing you money, time and a lot of frustration. This happens when people don’t look “under the hood” to see what they are really signing up for. We’re going to solve that problem right now. Lots of online brokerage firms tout low prices – and Scottrade can legitimately compete in that space. But saving a few bucks doesn’t mean much if you don’t’ get your trades executed well, the firm makes costly mistakes or you have no way to do your research. In short, there are other considerations like accuracy, speed, execution and customer service to name a few. Scottrade is often touted as a great “bare bones” broker because of their rock bottom pricing. But as you’ll soon discover, there is far more to this company than meets the eye. This brokerage firm has been serving the Do-It-Yourself investor since 1980. Off the bat, I like dealing with a company that has some history behind it. And I’m not the only fan. The firm has received numerous awards including the 2012 JD Power and Associates Customer Service Excellence Champion. Only 50 companies in the world received that award so it certainly got my attention. Also, Barons 2012 Annual Online Broker Review gave them 4.2 out of 5 stars for customer service and education. Even though costs are NOT the most important consideration, I know it’s still important to you so let’s get to it. The bottom line is that Scottrade is extremely inexpensive to use. Keep in mind that this low fee is for Internet trades only. If you have a broker-assisted transaction, it will cost you $27 per trade. Now let’s talk about mutual funds. You can buy over 3000 funds without any commissions. That includes a great many of the most popular mutual funds and index funds. Any fund not on this list costs $17 to trade. But the odds are you’ll find what you’re looking for on the “commission free” funds list. If you trade options it will cost you $7 plus $1.25 per contract. This is on the low side of the competition as well. Sweet. When you use discount brokers, you have to worry about slippage. That is the difference between the market price and what you pay for a stock. Often, discount brokers provide such terrible execution that investors lose more on slippage than they save on reduced costs for trading. This issue is where Scottrade stands head and shoulders above the competition. In fact, Scottrade offers excellent quality executions. Their internal auditor found that they have been able to execute trade at or within National Best Bid or Offer (NBBO) consistently getting you the best price for your trade executions. 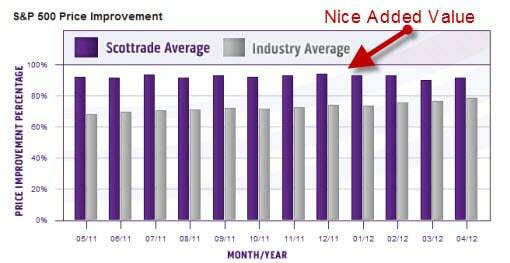 This is extremely important and one of the main reasons I feel comfortable recommending Scottrade to you. Look at the following chart. It demonstrates how important execution price is. You can see that Scottrade has delivered better pricing to it’s investors than most of the industry. There are no set-up fees, annual fees or custodial fees – ever. Most brokerage firms charge you an annual fee for retirement account but not Scottrade. So your Traditional IRA, ROTH, SEP, Rollover or SIMPLE plans are all free. If you decide to close your account there is no closing fee. And if your old broker charges you a closing fee when you transfer in, Scottrade will reimburse you up to $100. How thoughtful. They also don’t charge you an inactivity fee. If you make smart investments, you may have no reason to do any trading for an extended period of time. Why should a brokerage firm penalize you for making intelligent investments and holding on to them? Scottrade doesn’t. I like that. Most other firms will sock it to you to the tune of $50 or $100 if you don’t do any trading. Thanks Scottrade for being fair. Select the kind of account you want to open. Enter your name, address, date of birth, Social Security number and employer information. If you are opening a retirement account, have the beneficiary’s information as well. Use the electronic signature to sign the document (or print it out and fax it in). Transfer money into your account using a check, transfer, ACH or wire transfer. You can open an account with as little as $2500 if you are buying stocks, ETFs or funds. If you want to trade options, you’ll need a little additional paperwork and a minimum balance of $2000. There is no minimum if you are opening a retirement account. This is a great benefit if you are just starting out. Many times investors feel they have to be rolling in dough before they start investing. Not true. And Scottrade is a great place for you if you are a beginner. I took a tour of the trading platform and I liked it. Placing a stock or mutual fund trade was really easy. It was simple and took less than a minute. How sweet it is. What also makes trading easy is that the site provides real-time account updates. That way if something nutty happens to a stock right before you buy it, you’ll know before you make the trade. Prices, charts and news are all updated real-time. That’s important for a trader. And since account balances are also updated real-time, you’ll always know where you stand and how well you’ve performed. You also get a myriad of free research tools like the Dow Jones News to help you stay ahead of the market. This means you’ll have access to the same information that over 300,000 financial pros use. Talk about your level playing field. Score! You also get free streaming real-time stock and option quotes and charts. Together, this information can help you see what’s happening as it happens. The charting screens allow you to use up to 20 indicators to scrutinize price and volume action. You can also draw trend lines on your charts to try to get an idea of where your stocks are headed. And the tutorials section explains how to use the charting capability so that you can use those tools regardless of your experience or technical background. Nice. You can also use the Stock Screen tool to narrow down the universe of stocks you are considering for investment. This will help you find those most suitable to help you reach your goals. The tool sifts through the universe of stocks, ETFs and mutual funds to find those securities you’d be most interested in (based on the criteria you provide). That’s going to save you countless hours of research. What I liked about the screener tool was that it was very intuitive and easy to set up. 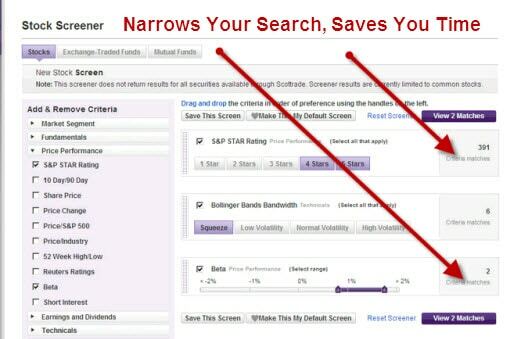 I also like the fact that I can screen for ETFs and mutual funds as well as individual stocks. You can create multiple screens if you so choose and/or can use the screens that Scottrade has already created. You can also set up text alerts so you are always informed no matter where you are or what you are doing. And while we’re on the subject of ease of use, the firm also provides free cost reporting. That means it will be a snap to do your taxes. This feature saves you and your CPA time at year-end. That will reduce the bill you get from your accountant because it will be easier for her to prepare your taxes. Nice. The company also has a mobile trading for the iPhone, Android and BlackBerry. The app is pretty broad and includes charts, technical and fundamental research, real-time quotes, market news and analyst ratings – on top of the ability to trade of course. In addition, Scottrade offers online tools and research to help support your investment decisions. I was impressed by the site’s “Knowledge Center”. You can get help on everything financial there. First, they have broad investment education to help you round out your overall understanding of investments and taxes. This section covers trading basics, fundamental and technical analysis, order types and much more. They also have a daily strategy and commentary page that keeps you abreast of what is happening in the market right now. 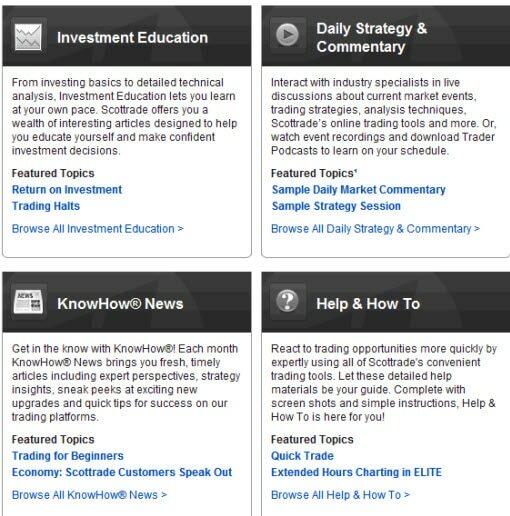 They have another section that provides trading ideas and shows you how to use the many tools on Scottrade.com in order to identify and take advantage of investment opportunities. They also have a tax guide that looks pretty helpful to me. But by far I was most impressed with the “Interactive Learning” center. In this section you can find calculators to help plan out your financial future. You can also plug in to the online community to bounce ideas off other like-minded people using Scottrade. And what I really love about this section is the Media Center which hosts any number of video tutorials to help you get up to speed very quickly with the site. I watched 3 of these videos and they break topics down well. They walk you though each task step-by-step in a way that is easy to grasp quickly. Of course Scottrade also has webinars that cover all these topics too. And what is really unique is that they host meet ups and in-person events in their branch offices all over the United States. Being in the business for more than 29 years, I am a stickler for professional and courteous service. I am happy to tell you that Scottrade offers world-class service without charging you an arm and a leg for it. Win-win (for you). Most of the online brokers have terrible service – that’s why they are so dirt cheap. I called Scottrade a few times and took their service team to task. I found the people who answered my call professional, thorough and fast. The person I spoke with gave me his direct number and invited me down to the branch to go through any questions I might have. And speaking of branches, Scottrade has more branches than any other brokerage firm in the market. They have over 500 offices compared to a bit over 300 for Schwab (which is the closest competitor). Beyond the convenient branches, they also offer extended phone support (Saturday and Sunday too) in addition to the easy-to-use website. What’s not to like? I looked high and low for problems and it was difficult to find any. The only issue I came up with is in respect to dividends. They do offer a reinvestment plan for mutual funds but not for individual stocks. I asked the representative about this and he told me that the firm is working on this and they hope to offer dividend reinvestment for individual stocks soon. I’ll keep you posted on this. Like most every brokerage firm, your accounts at Scottrade are covered by the Securities Investor Protection Corporation. This insurance will not cover you against market losses of course. SIPC insures the money you have in your money market account (up to $900,000) and it also protects you in case the firm collapses. Scottrade has extended coverage which is nice. It means you have SIPC coverage up to $25 million per customer. This coverage means you can feel safe doing business with this firm. That’s a weight off any investor’s shoulders these days. Should You Open and Account At Scottrade? Not everyone should. Different people have different needs. If you are a sophisticated options trader, I think OptionsHouse is a better fit because of the specialized options trading tools they provide. Likewise, if you are a high volume day trader, there may be better alternatives out there for you. But if you are a Do-It-Yourself investor who values great service, helpful tools, local branches, ease of use and very low fees, Scottrade is really a great fit for you. Investors have a lot at stake and the brokerage firm you use is a crucial success factor as I said. Since you can open an account for as little as $2500, why not give them a try? It costs you nothing, you can close your account anytime for free and you just might develop a great new investment partner. 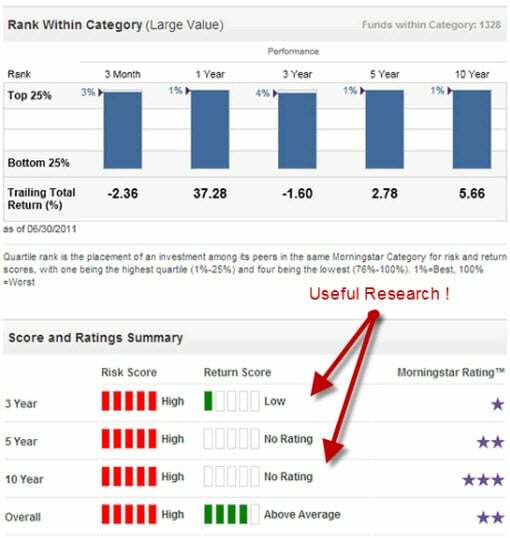 Your article was very informative and provided a great review of Scottrade. From my experience with Scottrade I dont believe you have to have a minimum of $2000 in an account to trade options, that, however, is the minimum in the account to have an active margin account. 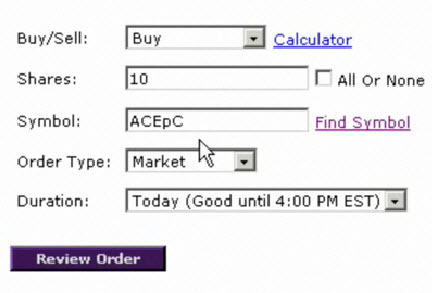 You also mentioned OptionsHouse for active options traders-have you seen Scottrades Options First? Great tools, great platform, same great customer service and fee structure. Great discussion on Scottrade and how it works. I have heard of Scottrade and I have been thinking o fopening an account with them. Based on the information you provided, I think I would like to have a first-hand experience on trading with Scottrade. Thanks for sharing!